ST. GEORGE – On the heels of Thursday night winds, Utah’s Dixie can expect another bout of wind Friday night into Saturday morning. The National Weather Service’s advisory forecasts 25-35 mph northeast winds with gusts as high as 55 mph from 10 a.m. from 10 p.m. Friday through 10 a.m. Saturday. 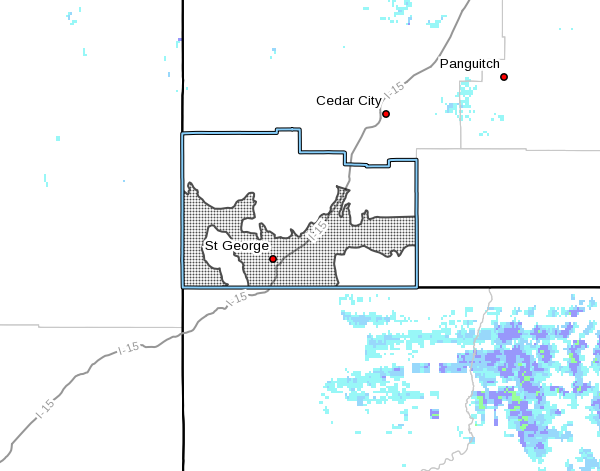 North-south oriented valleys and canyons of Washington County in southwest Utah, particularly along the Interstate 15 corridor from near Black Ridge south to near Hurricane are included in the advisory area. Winds in the Saint George area should not be as strong. Northeast winds will develop Friday evening, becoming strong later in the evening. These winds will continue into early Saturday morning before decreasing late in the morning. Strong crosswinds on local east-west oriented roads may make driving difficult at times. Winds on roads and highways can be particularly troublesome and dangerous. Drivers of high profile vehicles and those pulling trailers should slow down and be alert. All motorists in the advisory area should be prepared for sudden gusty crosswinds that will make driving difficult. High winds can also give rise to dangerous dust storms that impair driving visibility, as was the case in late March on state Route 21 west of Milford, resulting in a three-vehicle pileup. When dust impairs visibility, check to be sure you are clear of other motorists all around your vehicle then pull a safe distance off the paved roadway and away from moving traffic. Turn off your vehicle, set the emergency brake, turn off all lights in your vehicle and do not use your emergency flashers. Keep your seat belts on and stay in your vehicle until the dust storm passes.